Human mortality and immortality are themes of doubtless philosophical relevance, but as such they have received somewhat limited attention in contemporary philosophical discussions. Three of the classics of the pragmatist tradition – Emerson, Peirce and James – published brief pieces directly on the topic of immortality, and the issue also appears in some central connections, for example in Peirce’s and James’s elucidations of the pragmatist theory of meaning. This panel will explore the theme of (im)mortality in the writings of central classics of the pragmatist tradition as well as the pragmatist understanding of the theme’s meaning and significance. 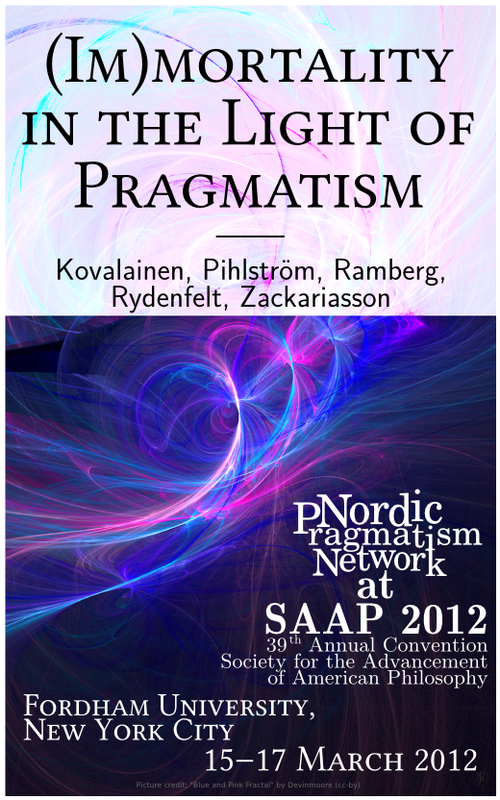 The Nordic Pragmatism Network organizes an invited panel session at the 39th Annual Meeting of the Society for the Advancement of American Philosophy. The conference takes place at Fordham University, Lincoln Center Campus, New York City on March 15-17, 2012. For the full conference programme and more information, please see the SAAP website. Somewhat surprisingly, the theme of immortality was something that not only James and Emerson but also Peirce took up. Just like James’s short piece “Human Immortality” (1898), Emerson’s later essay “Immortality” (1875) is primarily concerned with the wish for immortality, the impulse which drives men to the inquiry and provides in itself affirmative evidence for the view, rather than the precise argumentative justification for and against the doctrine. By and large, Emerson would agree with James’ characterization of immortality as “one of the great spiritual needs of man,” and in stressing the “inner significance” of life, alien lives no less than our own. Even more strongly so than James’, Emerson’s views on immortality have ultimately to do with eternity rather than (personal) immortality, let alone an afterlife high in the heavens. This paper will focus on Emerson’s take on human immortality, though I will also be offering some insists as to how to contextualize the theme not only with respect to the classical pragmatists but also Stanley Cavell’s reflections on human finitude. I will argue that the pragmatist view of meaning – especially as advanced by Peirce and James – has two interesting consequences in our understanding of the meaning of death and mortality. Firstly, the pragmatist approach enables us to understand both the normative and descriptive consequences as entangled (while not inextricable) parts of the meanings of intellectual concepts. Applied to the concept of death, the pragmatist is thus able to arrive at an account which does justice to both its natural and existential aspects. The second consequence is that the pragmatist account of death might centrally rely on the pragmatist view of meaning itself. If meaning by its nature is something that lies in the future, our mortality implies that the “true” meaning of our thoughts and endeavours is not fully personal or private by nature but rather lies in the future of our community as a whole. The limitedness of our lives then leads to an argument to the effect that our ideas cannot be limited to our lives’ confines. What kinds of problems does the fact that we are mortal present us with? In this paper, I want to relate the pragmatic model for problem-solving (inquiry) to human mortality via themes from James and Dewey. On the one hand, any struggle to restore equilibrium with the environment is (also) a struggle to fend off death, on the other hand, human beings (and other beings conscious of their own mortality) know that ultimately, these struggles will end in defeat. We both then have to struggle against and come to terms with human mortality, and I am interested in the relation between these processes. The former type of struggle, where the goal is to eliminate a problem by restoring equilibrium with the environment has, arguably, been at the centre of most pragmatic reflection on the pattern of inquiry and human problem-solving generally. The question then becomes: is such reflection is also helpful as we struggle to understand and answers questions about the existential meaning and significance of life, questions raised by the insight about the contingency of life?